These rugs are top-quality, durable, 100% high twist Nylon, and made in the U.S.A. They come in a variety of styles and sizes. 10 Year Limited Wear Warranty (does not include shipping cost). Hop aboard the Bible Train and explore the alphabet boxcars loaded with fun. Proverbs 22:6 at the center of the room will be a bold reminder of the importance of early learning. Because each rug is custom made, please allow up to three weeks for manufacture, plus shipping time. We regret that this rug cannot be shipped to an APO, FPO, or PO box. 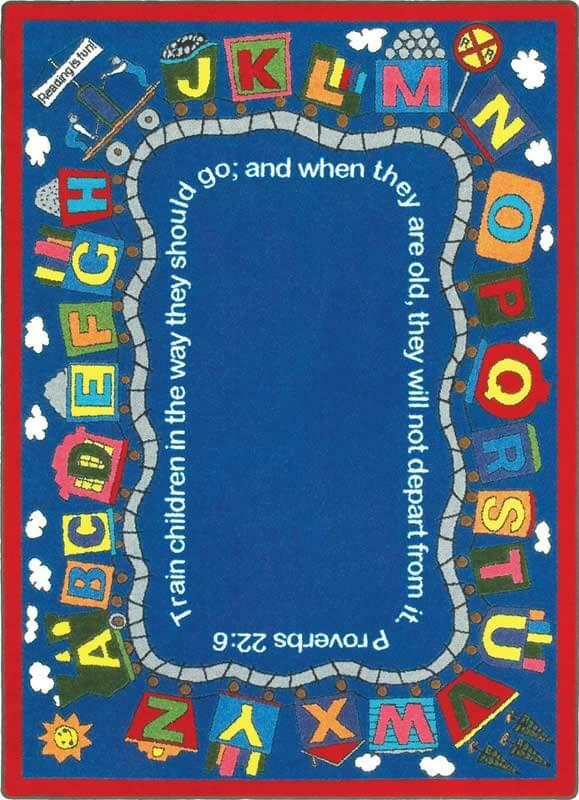 Bible Train© Rug - 5'4" x 7'8"
Bible Train© Rug - 7'8" x 10'9"
Bible Train© Rug - 10'9" x 13'2"